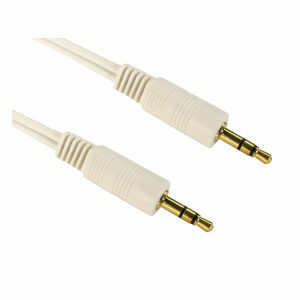 1m White 3.5mm Stereo Jack to Jack Cable. 1m stereo 3.5mm jack to jack cable, ideal for connecting audio devices. Ideal for connectin an ipod or MP3 player to a hi-fi or car audio system. Profigold PROA4801 1m Digital Coax Audio Cable. Profigold PROA4801 Skyline, high performance digital coax audio cable. RCA phono to RCA phono plug. 99.9996% Oxygen Free Copper ensures reduced signal loss and crystal clear sound. Multiple shielding gives maximum protection against Radio (RFI) and Electromagnetic (EMI) interference. 24k Hard Gold plated contacts for excellent corrosion protection. 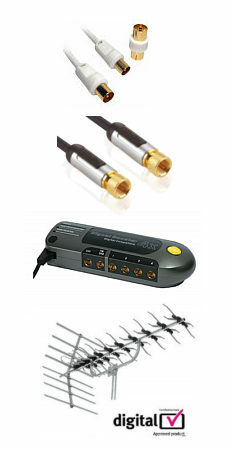 Pearlised chrome plated metal connector with metal inner case for enhanced RFI/EMI noise rejection. Colour coded connector headshells with silver soldering for easy installation and maximum signal transmission. Limited lifetime warranty. Connects from the SPDIF coaxial output on your dvd, blu ray dvd etc to your amplifier or surround sound system. Length 1m. A high quality lead with 3 phono connectors each end, designed for video and stereo audio connections. Gold plated contacts All metal phono plugs. Shielded cable. Ideal for connecting video and stereo audio with a single cable.